For thus saith the high and lofty One that inhabiteth eternity, whose name is Holy. Let no man doubt that the SON and the SPIRIT dwell with the FATHER in this realm which can in no wise be entered by any other. “For as the Father hath life in himself; so hath he given to the Son to have life in himself.” (John 5:26) The SON does not receive life from another source, rather HE is the LIFE. In the same fashion so the SPIRIT is the applier of that LIFE which HE shares with the FATHER and the SON. 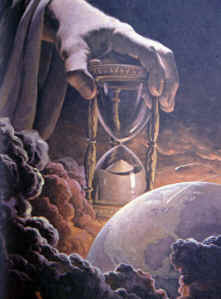 Eternity is the realm of HIS habitation and is totally unrelated to the passing of time. Quite often we hear men speak of eternity as if it is some extension of time before the creation of the world and then after the destruction of it. Such a concept is nowhere found in the scriptures but is simply a definition from the minds of men which falls far short of the sublime reality of the habitation of GOD into which no creature can approach. To praise the eternal Three. And ever is his time. And sees our ages waste. When the old creation dies. It is quite common to hear the terms “eternity past” and “eternity future” but there is no past or future in eternity. The passing of time does not exist in eternity. Many have mistaken the phrase, “before the foundation of the world” to be synonymous with “eternity” but I believe this is an error which can lead to other inaccuracies, in my opinion. The term “before the foundation of the world” is simply the description of the first era of time and is a descriptive phrase which indicates a chronology or timekeeping. “Before the foundation of the world” cannot be eternity because there are no “befores” or “afters” in eternity. Just like the phrase “in the beginning” must be chronologically after “before the foundation of the world” and is simply a manner of describing the dawn of creation. In the same fashion, we are not told in the scripture that we shall occupy “eternity” in the future when the new heavens and the new earth are instituted. We shall dwell with HIM in the “ages to come”. Because we are creatures, we can occupy no other realm than one which is measured. CHRIST had no beginning and no end since HE is the BEGINNING and the END. Yet all of mankind is finite as is all of creation because we all had a beginning. The gift of GOD is eternal life. Those who belong to HIM have been made the benefactors of it but we shall never have life “in ourselves” as HE does. All of our life springs from HIM who is the ETERNAL SPRING or well of water springing up in HIS people. We live /because HE lives and shall occupy the unending ages to come as the recipients of HIS mercy and grace which is manifested to HIS own by the gift of everlasting life. The glory of HIS mercy and grace is seen in HIS condescension to come and dwell among us. Had HE not come to us and revealed HIMSELF we could never have known HIM since HE dwells in the light to which no man can approach. But it pleased HIM to fulfill HIS purpose to redeem those people which HE chose before the foundation of the world. “Who, being in the form of God, thought it not robbery to be equal with God: But made himself of no reputation, and took upon him the form of a servant, and was made in the likeness of men: And being found in fashion as a man, he humbled himself, and became obedient unto death, even the death of the cross. Wherefore God also hath highly exalted him, and given him a name which is above every name: That at the name of Jesus every knee should bow, of things in heaven, and things in earth, and things under the earth; And that every tongue should confess that Jesus Christ is Lord, to the glory of God the Father.” (Phi 2:6-11).